While visiting Kannavi Honnapura Higher Primary School in Hubballi, we met Lakshmi, a 13-year-old student of Std VII, who wants to join the armed forces. When we asked her what inspired her to pursue this dream, she is quick to tell us how the Siachen incident, where 10 soldiers were buried underneath snow, changed the way she looked at the armed forces. While talking about it, we could see the passion and determination in her eyes. She spoke at length about the risks soldiers take to safeguard our nation. She says she admires the sacrifices soldiers make so that we can be safe. She wants to serve her nation and won’t mind working 24*7 for it. We asked her how she will sleep if she works for 24 hours. 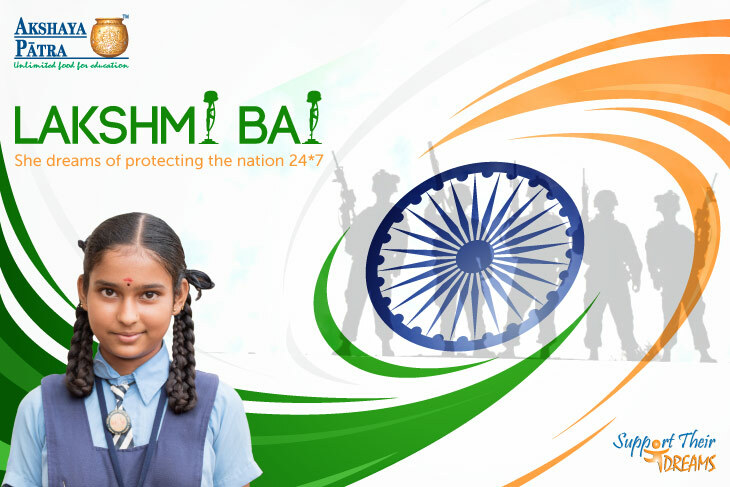 In reply, the brave girl said, “Protecting the nation is the primary objective. Sleep is secondary,” adding, “This is my tribute to the martyrs and the soldiers who are working day and night for our nation. A soldier takes care of his nation irrespective of the weather. He has to stand vigil when the nation sleeps peacefully. I admire our soldiers." Lakshmi enjoys mid-day meals served in her school by Akshaya Patra. “I do not bring lunch from home as I like the meals served in school, especially the pulao. The meals are highly nutritious, so my mother is not worried about my health anymore,” she says confidently. We were astonished with the way she was so vehement about protecting her nation and giving her all for the sake of it. With her patriotic fervour and the passion we could see in her eyes – we are sure that this girl will go on to make the country proud, one way or the other.